After the first day of the CTIA Wireless 2008 we first went to the AdMob CTIA Dinner Party in the Ozumo Restaurant. Sometimes the best networking is after the trade show. 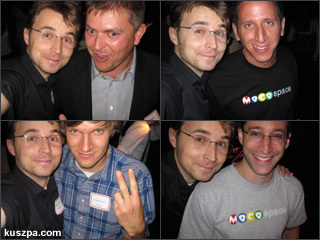 Like in the last year AdMob did a great job with their reception bringing together many folks from the mobile industry. All in all a great evening with people like Omar, Jason and Thomas (AdMob), Michael and Gustaf (Heysan), Annika (Netbiscuits), Matthäus (mobile facts) and Ilja (getjar). Afterwards I was lucky to grab an invitation from Jamie (MocoSpace) for the CTIA DefJam, MocoSpace and Quattro Wireless party, where I also met Justin (MocoSpace).